best does and their kids. These are the only ones we have left. This is the page where you will find any goats that we have available for sale. Most of our goats are sold on a reservation only basis so not all kids or adults for sale will be shown on this page. 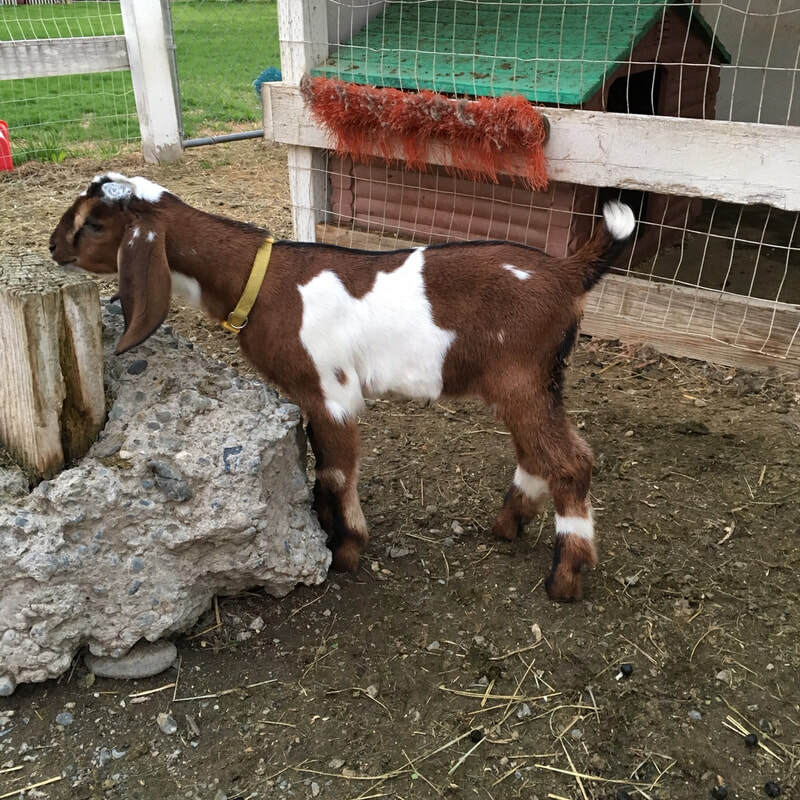 We reserve the right to retain any kid that we feel will improve the quality of our own breeding program and no kid or goat will be sold until we decide which ones will be retained. Once you have made your decision to purchase, we will require a $50 non-refundable deposit to hold a doe kid or $100 non-refundable deposit for a buck kid until the day of pickup with the balance due on or before that day. All kids must be picked up between 8 and 10 weeks. Any kids reserved and not picked up by that time will forfeit any money placed as a deposit and the kid will be sold to the next buyer. or transferred to another kid if available, whichever the buyer chooses. Dazzle at a few days old. This is Laz E Acre's Razzle Dazzle." She is out of our gorgeous doe, Laz E Acre's Tin Lizzie,"Lizzie," by Laz E Acre's Mr Blue Jeans, "Levi." "Dazzle" is a beautiful little doe out of our most feminine and longest in body doe on the place. She is not only dazzling in color and markings but she has moon spots as well. She has very good breed character with wide ears and a Roman nose. Her dam has a nice udder for only having a single doeling. Her udder is soft with nicely placed teats and large orifices. More importantly, she milks like a dream. If you are looking for a flashy little girl to add to your herd, Dazzle may be for you. A $50 deposit will hold her until weaning. She will be disbudded, tattooed, de-wormed and vaccinated before going to new home. If you choose to purchase "Dazzle" and her Dam "Lizzie" together and you can pick them up between April 25th and May 19th, you can get them both for just $750. This is a beautiful pair of does to add to your herd. Dazzle's flashy markings and Roman nose. This is Laz E Acre's Blue Blazes." He is out of our doe Newman Lake Amazing Love, "Maisy," by Laz E Acre's Mr Blue Jeans, "Levi." "Blaze" is absolutely gorgeous with wonderful breed character. He has a lovely Roman nose a with LONG ears and beautiful blue eyes. He isn't just pretty either. His dam has the best Nubian breed character on our farm plus she has a wonderful udder that is well attached with perfectly shaped and placed teats. More importantly, she milks like a dream. If you are looking for a boy to help with nice udders, milk, and great breed character, this little guy may be your man. A $100 deposit will hold him until weaning. Price reduced to $400 on this gorgeous boy. He will be disbudded, tattooed, de-wormed and vaccinated before going to new home. "Tucker's" striking colors and long ears. This is Laz E Acre's Tuck n Roll." He is out of our doe Newman Lake Amazing Love, "Maisy" by Laz E Acre's Mr Blue Jeans, "Levi" . "Tucker" is another gorgeous buckling with wonderful breed character. He has a lovely Roman nose a with LONG ears. He has a very striking coat pattern, with two braclets on his rear legs. His dam has the best Nubian breed character on our farm plus she has a wonderful udder that is well attached with perfectly shaped and placed teats. More importantly, she milks like a dream. If you are looking for a boy to help with nice udders, milk, and great breed character, this little guy may be your man. 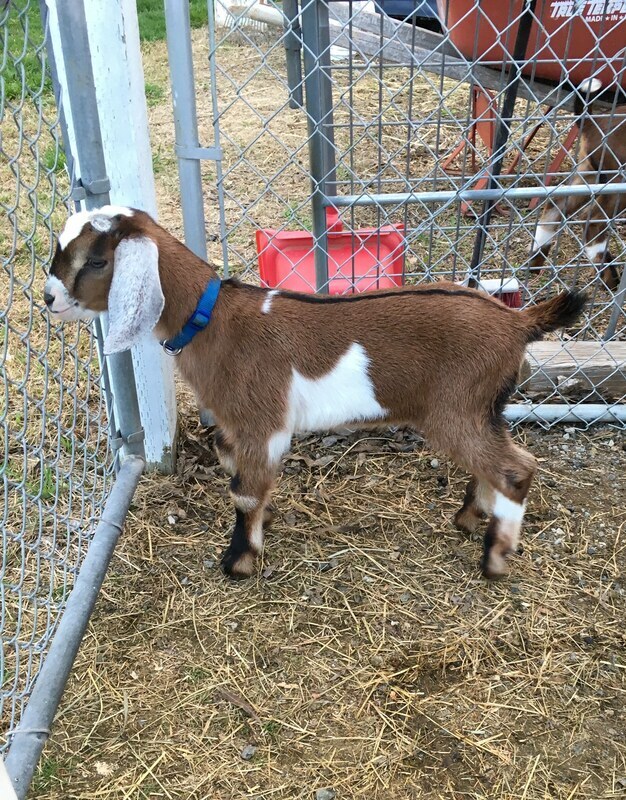 "Murphy" is a fun loving goat with personality plus. This is "Murphy." Originally I thought Murphy would be going to his new home as a wether but the more he has grown the better he has gotten. He is long bodied like his dam and has a smooth level top line. He also carries the milk and udder genetics of his dam and great grand dam. He is not as flashy as his brothers but he has personality plus. If you are looking for a boy to help with nice udders, and milk, this little guy may be your man. Murphy's great grand dam's udder on sire's side. Laz E Acre's Kit and Caboodle. This is "Laz E Acre's Kit and Caboodle" He is out of our sweetest doe, Green Gable's Shimmering Sands, "Sandee" by Eveland Farm's Hayzel's Joe-M. "Kit" is a darling little roan with fabulous milk lines behind him. His dam is a Green Gables doe with generations of lovely udders and great milk genetics. She has lovely wide and soft udder that is well attached with perfectly shaped and placed teats. More importantly, she milks like a dream. Kit's sire's dam's udder is just as gorgeous and full. She won best udder in show under Three different judges in the 2018 Wine Country Classic Miniature Dairy Goat Show. If you are looking for a boy to help with improving udders, and milk production, this little guy may be your man. Price reduced to $375 on this boy. Kit's Dam's udder. Beautiful udder and easy to milk.